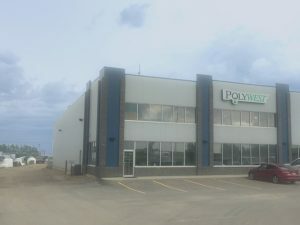 Branch Locations – Polywest Ltd. Please contact your nearest branch location for your liquid handling needs. Our head office, located in Winnipeg, is open from 8:00 am to 4:30 pm Central Time, Monday through Friday. 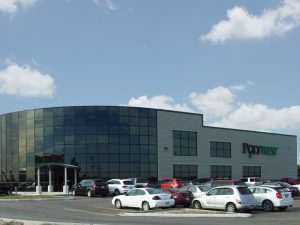 Our Winnipeg, MB Head Office is located on the western edge of Winnipeg on the south side of McGillivray Blvd. 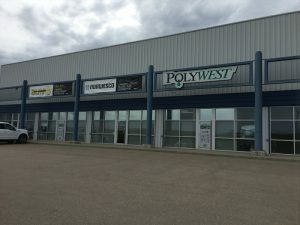 The location is 6 km NE of the Perimeter Hwy / McGillivray Blvd intersection or 3.5 km SW of the Kenaston Blvd (Route 90) / McGillivray Blvd intersection in Winnipeg. Our Saskatchewan branch is accessible from both Highway 16 and Highway 11 via Marquis Drive. This location is open from 8:00 am to 4:30 pm local time, Monday through Friday. Follow Louis Riel Trail (Highways 11 and 12) north from Circle Drive or downtown. Keep right to avoid the inadvertently accessing Highway 16. Turn east (right) onto 60 St. Immediately turn south (right) onto the Idylwyld Drive North service road. Travel south approximately 650 meters. Our location is on the left. Our Edmonton (Acheson) branch is lcoated at 26424 – 115th Avenue in Acheson. This location is open from 8:00 am to 4:30 pm Mountain time, Monday through Friday. Our Acheson branch recently changed addresses due to a township decision to revamp postal codes. Unfortunately, Google Maps has not updated their information yet! So, to find our Acheson location, you would head south of the Yellowhead Highway on Highway 60. Then turn WEST onto 114th Avenue. From there, turn NORTH onto 266 Street and proceed to 115th Avenue. You will then follow 115th Avenue around to the front of the building.